Cells generate extracellular vesicles (EVs) which are small lipid membrane-enclosed particles and function as pivotal mediators of intercellular communication by transporting biological information between cells and their microenvironment . Many cell types, ranging from embryonic stem (ES) cells [2, 3] to highly malignant cancer cells [4–6], are capable of releasing different classes of EVs. 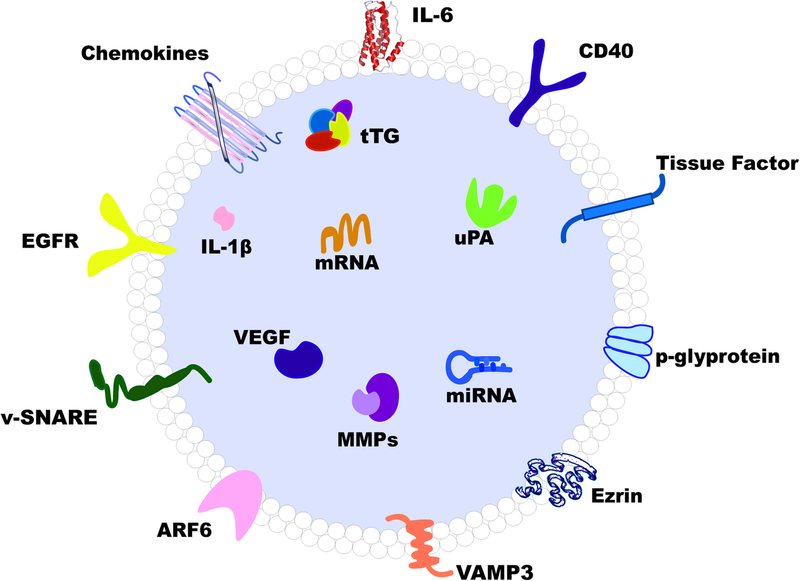 In terms of pathophysiological processes, EVs have been established as important players contributing to the development and progression of cancer, and are of relevance to diseases of various sorts [7–10], including autoimmune, inflammatory, cardiovascular, hematologic, and other diseases. 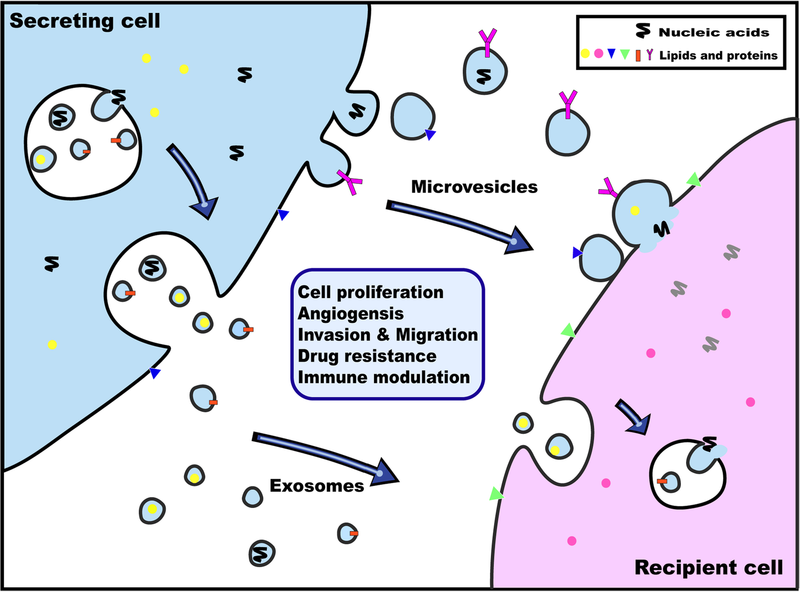 Two main types of EVs have been described as exosomes and microvesicles (MVs) [1, 11]. In addition, recent data have demonstrated the existence of additional varieties of EVs, which may differ in size, biogenesis, and molecular cargo profiles . Chemokines are small proteins that act by combining with their cell surface receptors. 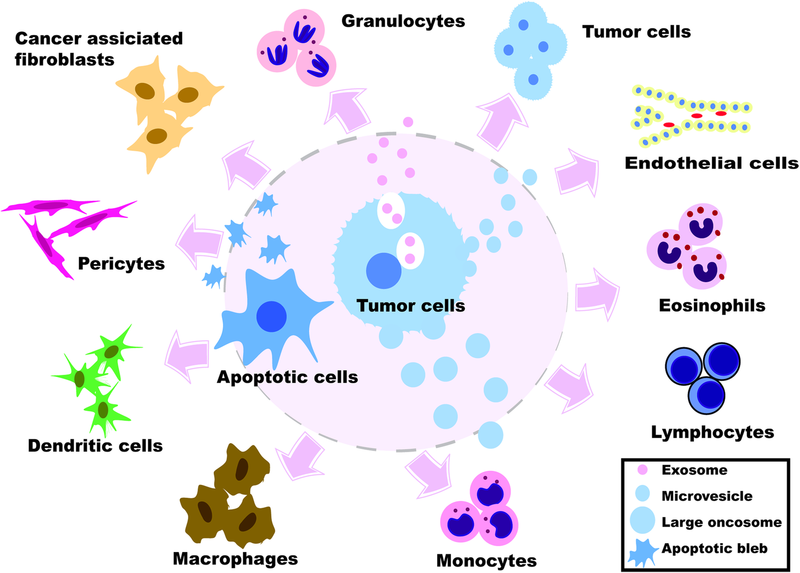 They take active roles in numerous pathological states and biological processes, including immune response , tissue injury , cardiovascular diseases , and oncogenesis . To date, more than 20 corresponding human chemokine receptors have been identified. Chemokines can be categorized by the position of the conserved cysteine residues [13, 29] into four different groups: C, CC, CXC, and CX3C. A chemokine receptor comprises seven-transmembrane domains, all with three extracellular and three intracellular loops. One of the intracellular loops is coupled with heterotrimeric G-proteins, capable upon binding of the ligand and receptor of triggering a cascade of signal transduction events [29–31]. Receptor nomenclature typically follows that of the chemokines, i.e. 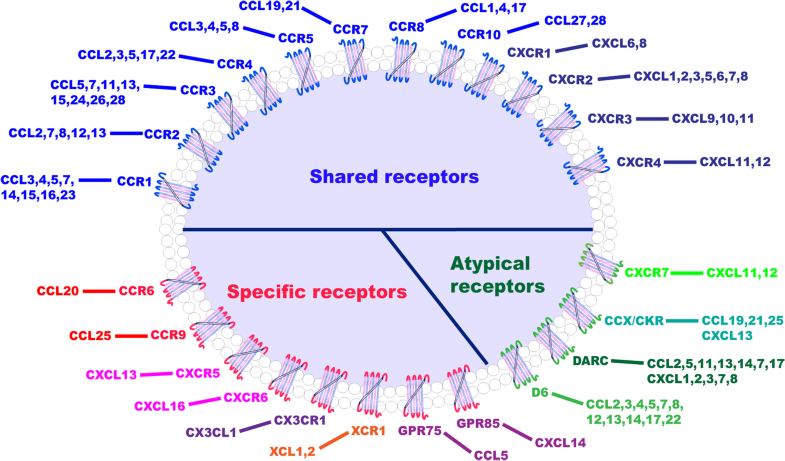 CC chemokines bind to CC chemokine receptors, CXC ligands bind to CXC receptors, with a high degree of redundancy in the chemokine family as multiple chemokines bind to the same receptor [29, 32] (Fig. 2).